WELCOME... and thank you for visiting our website. GOLDEN SPLENDOR Ministries exists to encourage all Christians to reflect GOD's glorious Golden Splendor, and become increasingly stronger examples of God's love to the world around them, as they embrace the high calling of knowing and living God’s Word with purpose and power. We have researched and developed resources and "tools" that have helped many dedicated believers share the good news of the Gospel in their circles of influence. Our desire is to help as many people as possible leave life-changing "footprints" in the hearts of those on their paths. ~God's Path to GOLDEN SPLENDOR by Jacki Martin which is the flagship book of our ministry. It was written to encourage the reader to reflect more of God's abundant love with each passing day. It includes study questions, key Scriptures, patterns of prayer, and many practical ideas. 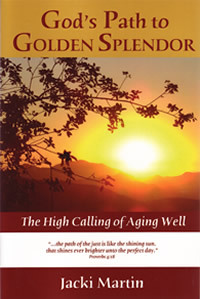 ~LARGE PRINT Excerpts from... God's Path to GOLDEN SPLENDOR includes Scriptures, Hymns, Prayers and practical ideas in a LARGE PRINT format. ~God's Path For My Life is a small guided booklet for writing your personal testimony of God's grace in your life. It has been used by many as a personal witnessing tool. ~Bible Verse Cards are small, freestanding, double-sided cards with verses in large print, which can be placed on the kitchen table, dresser, desk, in a work area, or taken to a hospital room, etc. They are constant, encouraging reminders of the goodness God. Verse Cards are sold in sets. They are perfect for personal use, and also make great gifts of encouragement that can easily be sent in a greeting card. ***If you shy away from using your credit card on the internet, contact us and we will work out other arrangements. Click CONTACT button for our address, phone number or e-mail.